1889: Launched by Cook, Welton & Gemmell, Hull (Yd.No.42) for Robert Hellyer & James Chant, Hull as GRAPHIC. 10.10.1889: Completed. Charles Hellyer appointed manager. 10.10.1889: Registered at Hull (H78). 1890: Remeasured under Portuguese rules 45.32n. 3.1890: Sold to Parceria de Pescarais Norte, Oporto. 3.1890: Registered at Oporto as CHIRE. 11.1909: Sold to William Collie & Samuel Caie, Aberdeen. 6.12.1909: Registered at Aberdeen as VIOLET CAIE (A302). 1.1.1914: Tonnage altered to 52.28 net under provision of Merchant Shipping Act 1907. 22.5.1914: Badly damaged whilst berthed at Fish Market in Aberdeen when struck by steam trawler STEWART BOYLE (GW27). 10.10.1915: Sold to Richard Gore, Tarleton, Preston, Edward Walmsley, Croston, Joseph Blackburn, Croston & Ernest Taylor, Thornton-le-Fylde. Ernest Taylor designated managing owner. 2.2.1916: Sold to The Croston Steam Trawling Co Ltd, Fleetwood. Ernest Taylor, Thornton-le-Fylde appointed manager. 5.1917: Sold to George Frederick Sleight (64/64), Grimsby. 14.5.1917: George Sleight designated managing owner. 21.5.1917: Registered at Grimsby (GY1051). 19.3.1921: Sir George Frederick Sleight Bart died. 18.10.1922: Probate granted to Raymond Lawrence Humphrey, Healing as sole surviving executor. 3.12.1925: Ownership registered to Raymond Lawrence Humphrey (64/64), Healing. 3.12.1925: Raymond Lawrence Humphrey designated managing owner. 12.1925: Sold to Moreau & Cayrouse, Dieppe. 4.12.1925: Grimsby registry closed. Registered at Dieppe as JACQUELINE-LOUISE (D??). 1.1926: Remeasured under French rules 148g 41n. 1937: Sold to shipbreakers and broken up. Dieppe registry closed. BECAUSE WE LIKE GOING TO SEA. 05/04/2013: Page published. 2 updates since then. This entry was posted in Steam Trawlers and tagged Croston ST, Edward Walmsley, Ernest Taylor, Joseph Blackburn, Richard Gore on April 5, 2013 by Fred Smith. 25.8.1908: Launched by Smith’s Dock Co Ltd, North Shields (Yd.No.383) for Neyland Steam Trawling & Fishing Co Ltd, Neyland (Alexander Scott, Llanstadwell, manager) as ANGLE. 6.10.1908: Registered at Milford (M225). 20.12.1910: When 160 miles from Queenstown sighted the schooner KATHLEEN, which had been on passage Rio Grande to Liverpool, dismasted and in distress. Connected with difficulty and commenced tow to Queenstown. 4.1915: Requisitioned for war service as a minesweeper (1- 12pdr) (Ad.No.1367). 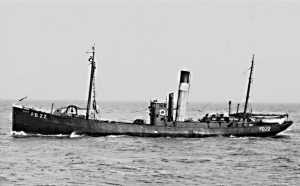 2.5.1915: Some 45 miles NW of Skelligs picked up nine survivors of steam collier FULGENT (2008grt/1910) (Admiralty hire) on passage Cardiff – Scapa Flow with coal and torpedoed by U.boat (U21) on 30.4.1915. Landed at Kilrush, Co. Kerry including body of Master C. W. Brown. 24.2.1919: Sold to The Croston Steam Trawling Co Ltd, Fleetwood (Joseph A. Taylor, manager). 8.3.1919: Registered at Fleetwood (FD57). 7.1.1924: Sailed Fleetwood and streamed log, severe south-east gale and snow storm off Isle of Man. Distance travelled underestimated due to gale and ran on the Bahama Bank, Isle of Man. Investigation concluded that disaster might have been averted if Bahama Bank light vessel had not been removed; eleven crew lost plus two pleasure trippers*. (Lost* – Sk.William Glynn; James Flaxman, Mate; Harry Gill, Bosun; Ernest Lord, Ch Eng; John Kay, 2nd Eng; James Casey, Ben Hickford, James Dennis, Deckhands; John Lord, & William Smith, Firemen; Charles Wilkinson, Cook; J Perkins & F Barrar, pleasure trippers. Notes: By the end of January the owners were getting extremely worried and despatched Lieutenant Roger Owen, of the Fleetwood Steam Trawler Owners’ Mutual Insurance Association to investigate a wreck that had been reported on the Bahama Bank, off the Isle of Man. Conditions enabled the divers on the chartered half-decker MOIRREY to dive on the wreck. The divers found the vessel open fore and aft and “Flattened like a fluke” and the greatest difficulty was experienced in finding any identifying marks. The letters “ANG..” was eventually found with the whole word “Fleetwood” underneath it. No bodies were ever found. A clock found by the wreck was stopped at 12:30 and the ship’s boat was located at one side of the vessel. Lieutenant Owen’s opinion was that the cause of the ANGLE’s loss was that the vessel was running before a south-east gale and ran into heavy snow on the 7th of January. Distance travelled was reckoned using a patent log which underestimated the distance when running before a gale. As a result the trawler overran her distance and ran onto the Bahamas Bank. Owen concluded that the disaster might not have occurred if the Bahama Bank Lightship had not been removed. It is highly probable that the two people with the surname ‘Lord’ were from the same family thus making the tragedy a double one for them. This entry was posted in Lost Vessels, Steam Trawlers and tagged Croston ST, Lost on May 14, 2012 by Fred Smith. 24.5.1902: Launched by A. Hall & Co Ltd, Aberdeen (Yd.No.394) for The Walker Steam Trawl Fishing Co Ltd, Aberdeen as STAR OF THE SEA. 6.1902: Completed (Thomas Walker, manager). 14.6.1902: Registered at Aberdeen (A538). 1.1.1914: Tonnage altered to 76.12 net under provision of Merchant Shipping Act 1907. 9.5.1914: Sold to Andrew Walker, Aberdeen. 1916: Sold to The Croston Steam Trawling Co Ltd, Fleetwood (Ernest Taylor, Thornton, managers). 21.1.1917: Stopped by U-boat (U.45) 43 miles NWxW1/2N of Inishtrahull Island, Co. Donegal and sunk by gunfire. Crew abandoned in boat. 30.1.1917: Aberdeen registry closed “Sunk by submarine”. 22/03/2011: Page published. 3 updates since then. 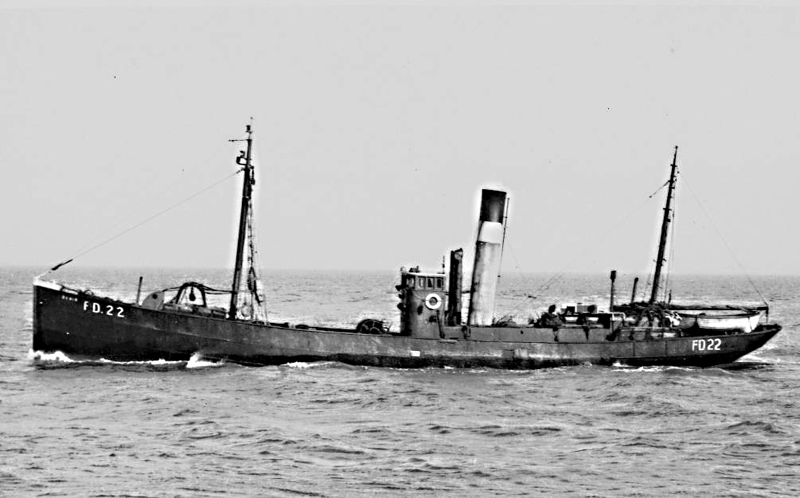 This entry was posted in Lost Vessels, Steam Trawlers, War Losses and tagged Croston ST, Lost, War Loss on March 22, 2011 by Fred Smith. 11.1904: Launched by Smith’s Dock Co Ltd, North Shields (Yd.No.758) for George H. D. Birt, Milford Haven (managing owner) as DANIA. 11.1904: Registered at London (LO187). 7.1905: Off the Spanish coast in storm force conditions (Sk. Joseph Huddlestone), William Shepherd (23), bosun, washed overboard and drowned. 21.7.1908: Sold to Harley & Miller Ltd, Liverpool (Robert Harley, manager). 24.3.1917: Sold to The Croston Steam Trawling Co Ltd, Fleetwood (Ernest Taylor, manager). 3.1917: At Fleetwood. Fitted with Nordenfelt 6pdr gun (No.268); compliment increased by two gunners. 24.2.1919: Registered at Fleetwood (FD22). 1.2.1927: Sk. H. Buckley was fined £20 plus costs at Bangor for trawling within the limits off the Anglesey coast. 1936: Sold to Thos. W. Ward Ltd, Sheffield for breaking up. 13.12.1937: Fleetwood registry closed. Breaking up completed. 06/11/2017: Removed FMHT watermark from image. This entry was posted in Steam Trawlers, Steamers (Picture) and tagged Croston ST on January 15, 2009 by Fred Smith. 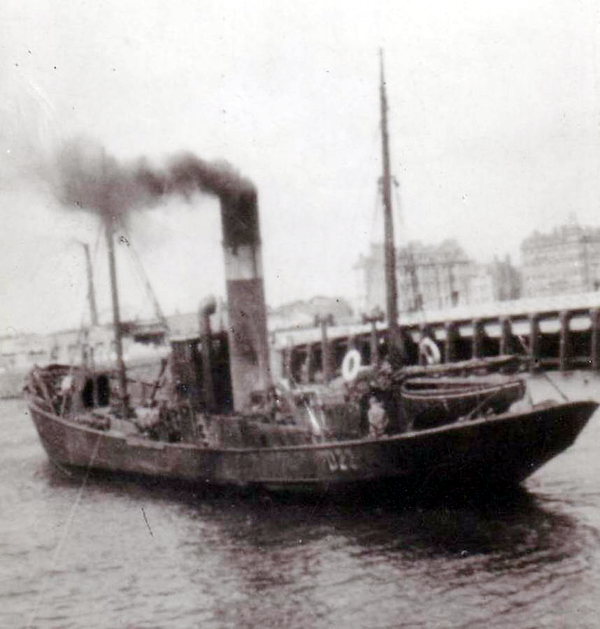 27.5.1899: Launched by Gourley Bros & Co, Dundee (Yd.No.192) for The Tay Trawling Co Ltd, Dundee as TAYSIDE. 1907: Sold to Thomas Davidson, Aberdeen (managing owner). 22.8.1907: Registered at Aberdeen (A156). 1918: Sold to Croston Steam Trawling Co Ltd, Fleetwood (Ernest Taylor, managers). 4.3.1919: Registered at Fleetwood (FD54). 1920: Sold to the The West Carbery Co-operative Fishing Society Ltd, Baltimore, Co. Cork (John Collins, manager). 8.12.1920: Fleetwood registry closed ‘not required by new owners’. 12.1920: Registered at Skibbereen, Co. Cork. 1.1921: Foundered 5 miles ES-E of Galley Head Lighthouse when on passage Baltimore towards Queenstown, Co. Cork. 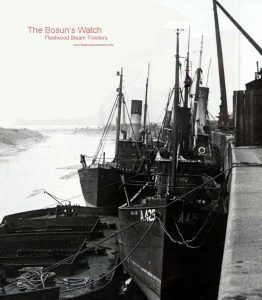 This entry was posted in Lost Vessels, Steam Trawlers and tagged Croston ST, Lost on January 8, 2009 by Fred Smith.